At Atlas our entire 50 year history has been focused on optimizing the movement of heavy sheet metal and dies during the stamping process. Our Die Change Systems solve pressroom production problems with our proven Pressroom Automation equipment. 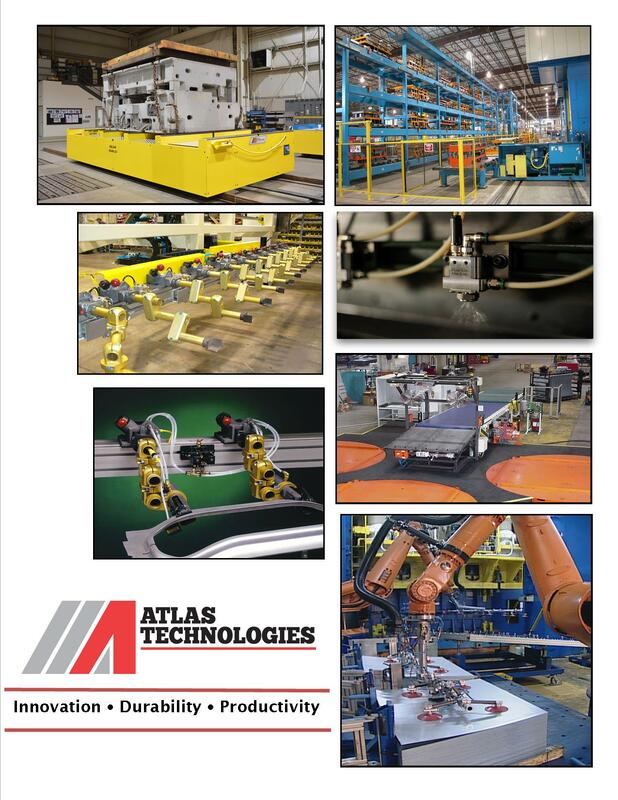 Atlas’ Die Transfer Carts and Die Tables are world renowned, providing consistently controlled movement of heavy, oversized loads, each designed to customer specifications. Atlas is a full service facility with the tools, talent and experience to provide objective based engineering studies. We will examine the alternatives, finding the most productive and cost effective mixture of manual and automated operations tailored to suit each individual customer and their requirements. Atlas designs and builds the most comprehensive range of accelerated die change systems in the industry. Our Die Change Systems are used in hundreds of installations for fast, accurate and safe die or mold changeover. They provide controlled movement and positioning of dies in stamping presses or press lines, via pendant or line controls. 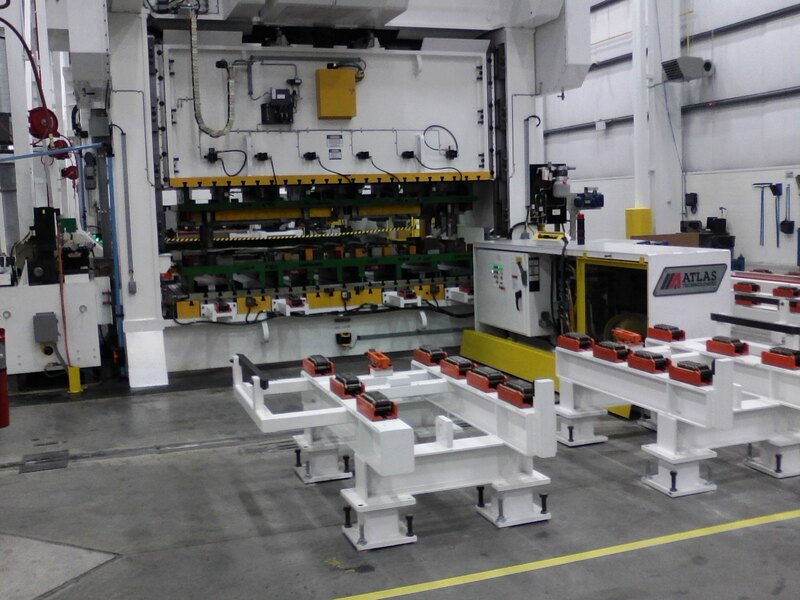 Die Change Systems utilizing powered die transfer carts and integrated die racks, can be used in applications ranging from a single press or multiple independent presses, to sister tandem lines. With an Automated Die Change System, handling of heavy dies becomes highly efficient and manageable. Die change is reduced from hours to minutes. Scheduling for reduced inventory becomes practical…Just-in-Time becomes possible. Stock piles disappear and response time quickens. Potential damage to dies is reduced, while providing the ability to efficiently pull and inspect dies. And most importantly, Die Change Systems increase press production time! 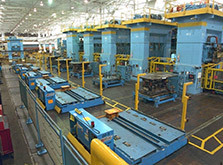 Atlas Die Tables utilize a combination of push/pull modules and powered conveyors to automatically load and unload dies to and from a press. The tables are often used in combination with elevating die carts for automatic die storage and retrieval. The height of the table is adjustable and can service two adjacent presses of varying heights. The die table itself is moved by a fork truck or crane. Atlas Die T-Tables are based on our die cart and rack technology combined. 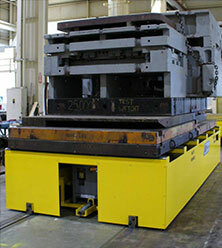 The long rack portion contains a conveyance device and is divided by a center die table section complete with a push/pull module. The incoming die is delivered to station 1 and conveyed to station 3 for pre-staging and/or waiting for changeover. Then the out-going die is pulled to station 2. The conveyor indexes both dies to the left to move the outgoing die to station 1 for pick up and moves the incoming die station 2, and then into the press. Atlas T-Tables provide a complete, cost effective die change capability in situations where floor space and/or economic constraints prohibit the use of die carts. Atlas has been a pioneer in die change technology. 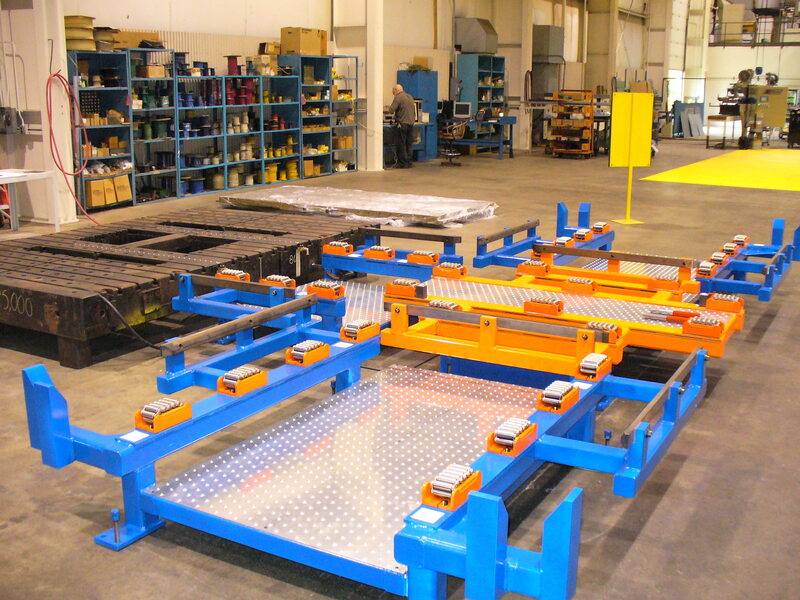 We have become an industry leader in heavy and large powered die transfer cart based floor handling systems over the last 50 years, providing 800 and counting installations around the world. Our innovative and robust engineering practices are the highest of quality, to the point that Atlas “is” the benchmark in reliability and maintainability. The engineering architecture of our transfer carts are modular, scalable and flexible. Transporting heavy and large loads will seem effortless with our Atlas Die Transfer Cart featuring a hand held manual operator pendant. Our transfer cart design allows us to provide the perfect solution to a diverse group of customers, throughout numerous industries.